Assaults on collective bargaining, a proposal to eliminate child labor laws, a tax structure that favors the wealthiest of the wealthy, no financial gain for workers despite huge increases in per-worker productivity, a tax-funded bailout for the financial speculators who all-but-destroyed the American economy, a law allowing corporations to anonymously give unlimited amounts of money to politicians, increasing employment insecurity, a jobless “recovery,” and a billionaire-funded scheme to pit the public-sector middle class against the private-sector middle class so as to reduce both sectors to a lowest-common-denominator of economic insecurity. Looking at all this from across the Atlantic, a German acquaintance of mine recently noted “if this happened in Germany, cars would be burning in the streets.” Why, he wondered, were working and middle class Americans so docile in the face of this aggression by Wall Street and its paid-for politicians in both major parties? Why were the protests in Wisconsin an anomaly, rather than part of a nation-wide outcry against the persistent assaults on the vast majority of the population by the plutocratic few? It’s not for lack of anger. Much of the country is seething with barely-repressed rage at the state of things, and optimism is hard to come by. But the anger rarely seems to manifest in ways that actually help to roll back any of the policies of the plutocracy. At a time when collective action is toppling corrupt oligarchies in Egypt and Tunisia, Americans seem unable to stop the decline of their own country into a land with third-world level wealth polarization and a government utterly beholden to the interests of the moneyed few. Why? A large part of the answer can be found in Louis Hartz’s classic 1955 study of America’s political heritage, The Liberal Tradition in America. The “liberal tradition” of the title isn’t what you might think: it’s the classical liberal tradition, something that’s so hegemonic in the United States today that it includes just about all politicians, whether they call themselves “liberal,” “conservative,” “moderate,” “progressive,” or “libertarian.” Liberalism, in this sense, is to be distinguished from socialism, or communism, or fascism, or traditional feudal societies — from any tradition that places a high value on collectivism. It’s the tradition of people like Adam Smith and John Stuart Mill, the tradition of individual liberties, nominal equality in the eyes of the law, and the valorization of the marketplace as a field of open competition. Much of American life functions in line with this model, although increasingly there are violations of the model (as in the rigging of financial laws to allow market manipulations and the purchasing of political influence, the de facto inequality of people before the law due to the pernicious influence of money, etc.). But despite those areas in which the American ideal of classical liberalism has ceased to function, the ideals of classical liberalism remain the only widely-held political ideals in American society, and as harsh as our partisan politics can be, the struggles in American politics tend to be intramural among slightly different tendencies of classical liberalism. …lacks a genuine revolutionary tradition…and this being the case, it lacks also a tradition of reaction… and becomes as indifferent to the challenge of socialism in the later era as it was unfamiliar with the heritage of feudalism in the earlier one. What socialist or workers’ movements there were in America were never as strong as they were in Europe, in large part because of America’s different tradition, and the circumstances that gave birth to it. I really do mean it when I say there are reasons to be grateful for this. Despite some very repressive moments in our history — the Palmer Raids, the Red Scare — we have avoided the kind of violent revolutions that occurred in so many European countries. But there’s a downside, too: the classical liberal tradition has meant that it has been very difficult for Americans to find a way to effectively express frustration with what has been happening to them. They’ve been economically undermined by a whole host of forces — the globalization of capital, the rigging of laws to chip away at unions, the end of meaningful oversight over banking — you name it. But with the exception of Wisconsin, most protest seems to be individual, inchoate, and aimed at the government rather than the plutocrats who use the government to further enrich themselves at the expense of small businesspeople, workers, the middle class, and the poor. It can be violent, but it is utterly ineffective — a man smashing his small airplane into an IRS building, to take one example from not so long ago, is an instance both horrifying and pathetic. 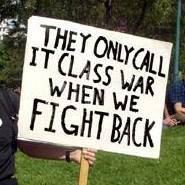 It’s not like the people who wage a kind of class war against the majority of Americans don’t understand that there’s anger out there. In fact, they’ve been very savvy about harnessing that anger and allowing it to be vented at safe targets. The billionaire Koch brothers’ funding of the allegedly grassroots Tea Party movement is one example of a plutocratic funneling of populist rage into a safe channel. Glenn Beck’s big rally in Washington, which took anger and through a kind of alchemy converted it into schmaltz, is another. I don’t know whether the classical liberal tradition will continue to keep Americans from finding ways to act together to protect themselves against the very rich, who continue to wage a distressingly successful class war against the rest of us. And I’m not keen on the prospect of cars burning in the streets, either. I do wish we could find our way to something like the situation Germans and Scandinavians have found for themselves, though: situations where high-wage, industrial, export-based economies flourish without the brutal inequities we see in America today. Wow! Thank you for this. The topic keeps coming up more and more frequently in conversations, with expressions of frustration because no one knows what to do that would mobilize large numbers rather than being just another of those idiosyncratic yelps of rage you mention. Wisconsin came, got voted out of existence, and then everybody went home. Now what? 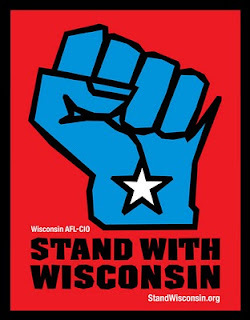 "Why were the protests in Wisconsin an anomaly, rather than part of a nation-wide outcry against the persistent assaults on the vast majority of the population by the plutocratic few? It’s not for lack of anger." Maybe it's for a lack of vocabulary. Maybe class consciousness (or education, the skeptic's instrument) is a matter of knowing the etymology of words like robber baron, radical, and reactionary. I think a lot of Americans want to believe we're a democracy without class, so that whenever something this obviously a class war becomes obvious to all, they say nothing out of embarrassment or paralysis. No one wants to believe that America has classes. Obviously we do, though, and never more so than now. 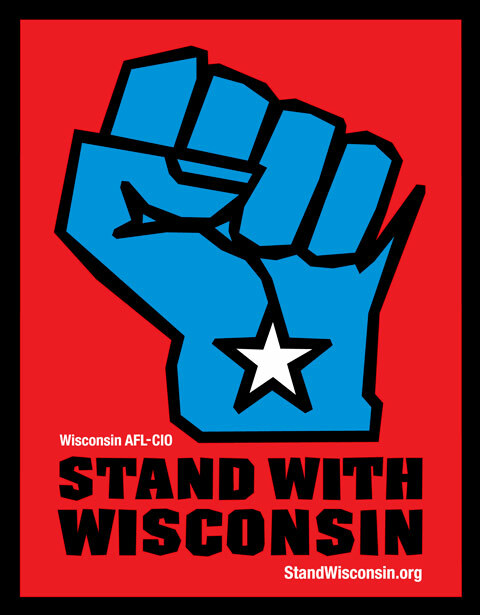 Speaking as a Wisconsin resident, I find the grass-roots protesting very heartening, as it crosses all lines of belief and grouping, and gathers together a huge number of people who want genuine change. I said it when the Tea party types got elected: well, they talk a good ideology, but can they govern? Do they really have anything beyond their cant to offer? The answer is, apparently, No. And hence the angry protests now, which are symbolic of a lot of anger that's been building for awhile, but hasn't yet had a voice, or a target to focus on. It seems that the Tea Party (which has become an analogy for libertarianism,) began with expressing popular frustration about the state of things, yet has devolved into a cheap neo-con circus. The historical pivot that the Tea Party jumped off from even lends itself to co-opting by the monied, such as the Koch brothers. The protest that was the "real" tea party was an offense against the unrepresented taxation of imports. Such taxation in an era devoid of loopholes would undoubtedly hit the wealthy right where it hurts. In current affairs, the ire of the Tea Party is aimed at "big government" that, since the Depression, has been geared toward assisting the poor and middle class. The erosion of the middle class, and thus the erosion of rational discourse about class, is almost exemplified by the raucous fervor of the Tea Party and its failure to find a real target. It appears that the Tea Party is today as it was then, a protest over taxation led by "dudes playing the dudes, disguised as other dudes." That is, conservative money playing the middle class, disguised at the proletariat. Yes, Tropic Thunder is the interpretive paradigm for our times. I was so happy to see this post. One of my lead characters, Tom, goes through a painful process during the last Great Depression of learning that what happened to him is not his fault. The flip side of "free market" and "competition" is self-blame: they want us to think that if we're not Donald Trump, we have no one but ourselves to blame. Another problem is that students are given no labor history in school. We need a good labor union movie. It's time. It's depressing how little schools teach about labor history. And now the governor of Maine wants to tear down a labor history mural, because it fails to sufficiently genuflect to the nobility of capitalists. Argh.